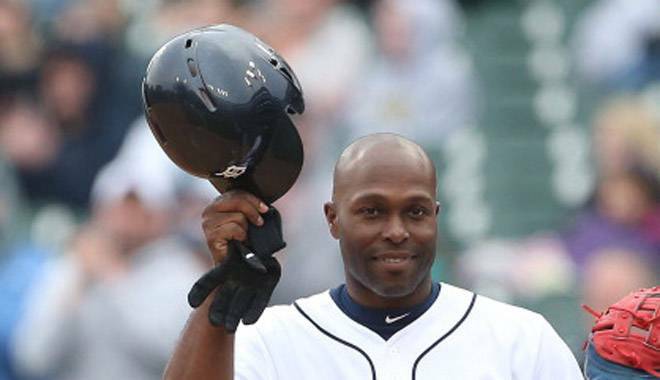 A couple of weeks ago I took a look at Torii Hunter’s late career offensive resurgence and explained that a change in his approach has paid off for the Tigers’ RF. Hunter has had a very nice career overall and was once consider one of the game’s elite defensive players. If you’re curious about Hunter’s current and former swing, check out the link above, but thanks to a reader question over the weekend, this post is going to discuss Hunter’s defense. 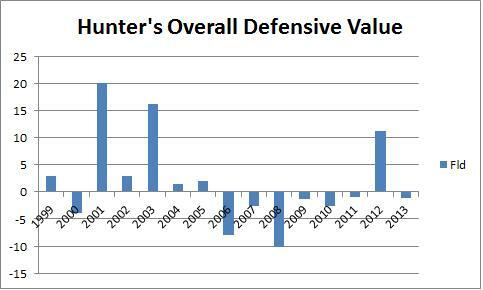 The genesis of the discussion was the reader wondering how Hunter’s defensive numbers look this season compared to last season because the reader noticed he’s seemed to make some bad plays out in RF. My eyes tell me the same thing. Hunter has made a number of poor plays this season at bad times. Let’s take a look at Torii Hunter’s defense this season and throughout his career. Let’s start up front and say that I’m going to present the numbers, drawing heavily from Defensive Runs Saved (DRS) and Ultimate Zone Rating (UZR), and leaving the reputation to the side. Hunter won a lot of gold gloves and was all over the Web Gems in the late 90s and early 00s. You may remember him making amazing plays in center, but this presentation is about data. I don’t feel comfortable giving you a real scouting report from his early days because that was before the days of MLB Network and MLB.TV when I couldn’t watch all the baseball I wanted to. I’ve seen him for 100 games this year so I’ll give you the scouting report from this season and the raw data from other seasons. Let’s take a look at the overall numbers. Remember a few things. Up through 2009 he played almost exclusively CF and after he started blending into RF and has played just one game in center since the start of 2011. What is important here is that defensive metrics judge players compared to average at their position meaning that a +10 in CF is a better defensive player than a +10 in RF. Additionally, defense peaks early. Hunter should get worse as he ages, everyone does. 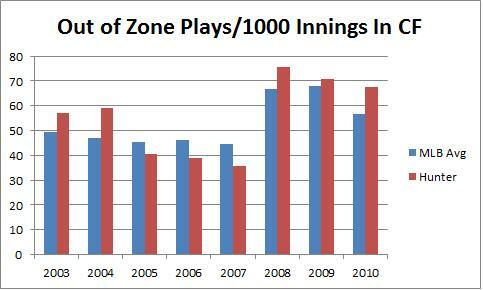 Total Zone is an approximation based on play by play data that covers players up through 2001. In 2002 UZR becomes available and DRS comes in 2003. So these numbers will get more accurate as we move forward and Hunter’s best seasons happen to overlap with the infancy of advanced defense. Don’t take these numbers as gospel. They aren’t perfect, especially early. I’m just presenting the information. A final aside is that defensive metrics are generally a good description of what happened in a given season, but they take very big samples (close to 3 years) to provide a lot of predictive value about a player’s true skill level. Every 10 runs by these defensive scores equals about 1 win. This Fld number is Total Zone until 2002 and then UZR. This is what FanGraphs uses for the defensive component of Wins Above Replacement (WAR). What you see on the surface here is that Hunter is essentially an average defensive player over his career with a couple of fantastic seasons and a couple of poor ones. The overall picture says Hunter isn’t a great defensive player overall and is pretty much in line with his career numbers this season. Now let’s take a look at UZR and DRS in his career in CF only. I think this is pretty interesting. He didn’t play a ton of RF in 2010, so I’m not too worried about it. 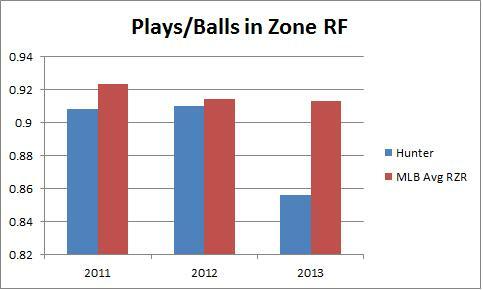 In 2011 and 2012 DRS likes Hunter better in RF than UZR does, but in 2013 it flips. And that actually corresponds perfectly to what I’m seeing with my own eyes. Hunter’s range actually looks pretty good to me this season. What Hunter is doing poorly this year, in my opinion, is coughing up easy plays. I can think of at least five instances off the top of my head where Hunter got himself to medium difficulty fly ball and he just botched the catch after doing the hard work. He’s also made some atrocious throws in terms of accuracy and has misjudged the wall a few times. 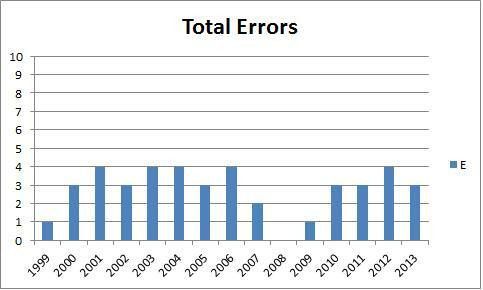 Hunter is making bad mistakes this year, and the data seems to suggest that this might be new. So the defensive metrics disagree about Hunter. Defensive Runs Saved thinks he’s pretty good (averaging about +5 DRS per season since 2003). 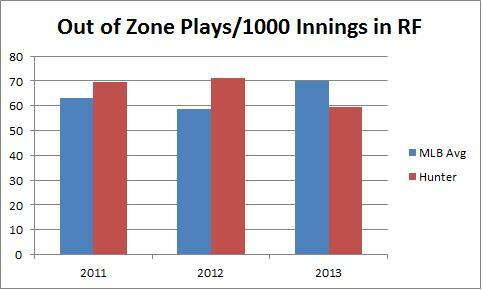 Ultimate Zone Rating thinks he’s right about average overall with some heavy year to year variation. If you trust UZR, he’s having an average season at the end of an average career. Defensive Runs Saved says he’s having a bad season at the end of a pretty good career. In total, over the last 11 seasons the difference between Hunter’s UZR and DRS works out to about 4.5 WAR. That’s an interesting difference and it’s one that makes sense. Let’s take a look at another statistic that I like. What is his defensive efficiency? What percentage of the balls hit to his defensive zone does he catch and how many out of zone plays does he make? In his CF days he made more plays that average early in his career and started falling behind a little bit as time went on. That makes sense. In his early days he had great range and as he aged the young kids coming up started passing him. Here are the numbers in RF. This continues the theme we’ve been seeing. 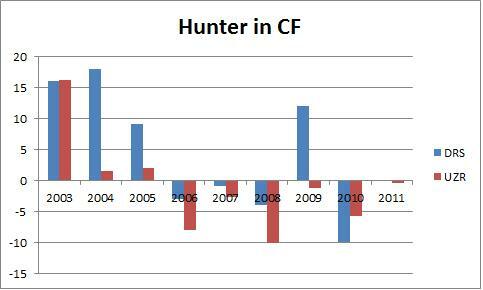 Hunter was right around average in his first two seasons and has basically collapsed this season. 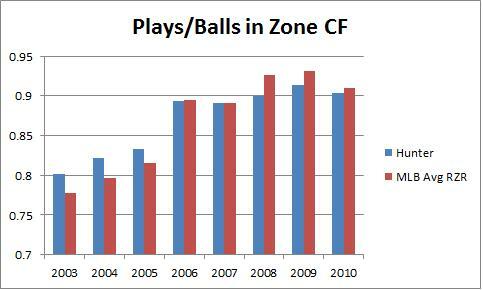 Hunter is making fewer plays on balls in his zone this season, likely because of the misplays I’ve been talking about. It’s not limited range, it’s Hunter making mistakes. That’s how I blend this information and my own observation. Hunter seems just as athletic, but he’s not executing. What these two charts show us is that Hunter has been in the ballpark of league average in making plays outside of his defensive zone. Recognize that these numbers were brand new in 2003 and are constantly being refined, he’s sometimes been better and sometimes worse than average. So what does this all mean? 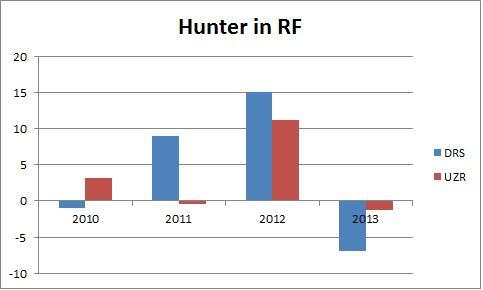 For me, it says that Hunter has obviously declined as he’s aged but that he hasn’t lost a ton of his range relative to what you would expect given typical aging curves. Generally speaking, human scorers like Hunter’s defense more than the machines, until this season when the humans have turned on him. That turn, which lines up with what the plays/balls in zone data tells us and my own visual inspection, tells us that Hunter is getting hit this season for making mistakes fielding the ball, not getting to it. On several occasions Hunter has gotten to medium difficulty ball and dropped it or misjudged the wall or given up on a ball in front of him a little too early. These kind of plays aren’t called for errors, but they are absolutely mistakes made by Hunter that should count against him. So the story here is that Hunter was probably not quite as good a defender as you thought he was coming up, but that he was pretty good and remains pretty good given his age. This year he’s struggled, not with declining range, but just some stupid mistakes. You can judge that how you will, but it appears to be a sign that his defense could improve rather than continue to decline for the rest of the season. Hunter’s bat has been a nice addition for the Tigers this year and his defense, despite its current issues, is still dramatically better than what Brennan Boesch offered the last few seasons.